Philadelphia's thriving middle class made the city a mercantile mecca, home to some of America's largest and most innovative department and specialty stores. Market Street between Seventh Street and Philadelphia City Hall was lined with five major department stores: John Wanamaker, Strawbridge & Clothier, Gimbels, Lit Brothers, and N. Snellenburg & Co. Here, shoppers could buy everything they needed to furnish their house from attic to basement, as well as the house itself. On nearby Chestnut and Walnut Streets, the carriage trade selected silver and jewelry at J.E. Caldwell & Co. and Bailey Banks & Biddle, haute couture at Nan Duskin and the Blum Store, and men's clothing at Jacob Reed's Sons. 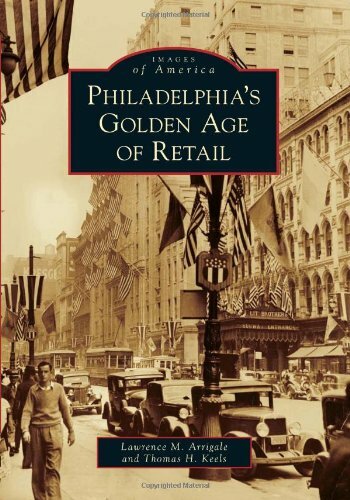 Images of America: Philadelphia's Golden Age of Retail illustrates how these emporia taught generations of Philadelphians the proper way to live.